Established in 1990, Huws Gray has grown to become one of the largest independent merchants to the domestic and trade markets in the UK, with branches from Herefordshire up to Heckmondwike in West Yorkshire. From below-ground drainage products, bricks, blocks, doors, windows and roofing materials through to plumbing supplies, Huws Gray specialist centres offer the complete package the strong Huws Gray Branch Network also offers an e-commerce brick website supplying to customers across the UK and hold an extensive stock-holding including over 8 million bricks (with over 700 varieties to manage). 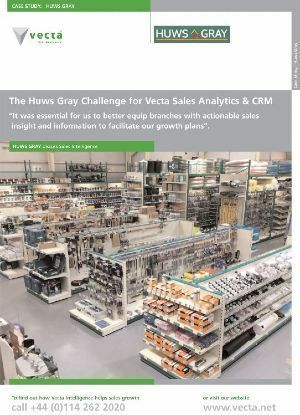 ‘Pre’ Vecta, the management at Huws Gray were aware of the importance of using customer and sales information, but it was still proving difficult for their branches and management to see the wood from the trees. Previously the reports used were numerous and cumbersome and took considerable time to produce and analyse - staff often felt that they were working blind with only a snapshot of what was happening at any given time. Any gaps or changes in purchasing trends and anything that needed prompt attention was easily missed. There was an over reliance on a small number of people and too much time spent searching for detail rather than on taking action to resolve the situation. Report are produced in one click and the analysis is automated. Gaps, seasonal trends or sales erosion are identified instantly. The team now use a central sales solution to help manage their own time and accounts quickly and easily - less reliance upon accounts or finance teams.